Just a quick update today, as an experiment. 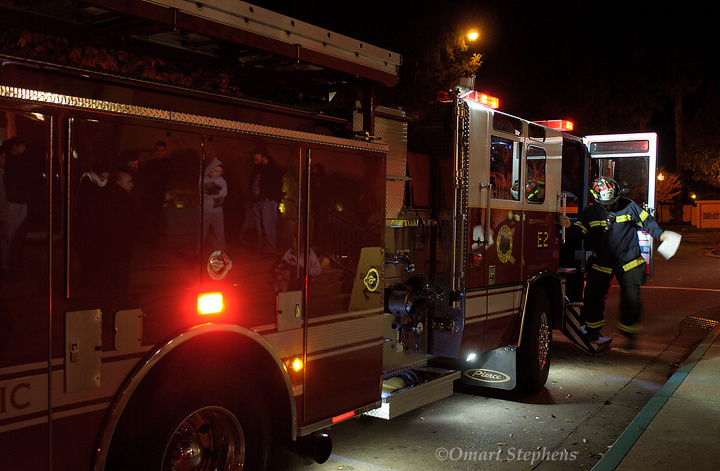 On Tuesday, the fire alarm in my apartment went off right as I was going to sleep around 4:00 a.m. I grabbed my camera and headed outside in my fashionable Snoopy-PJs-and-hiking-boots outfit. It was pretty dark except for a spotlight the fire engine had pointed toward the main entrance, where a number of tenants were standing outside. After trying for a couple minutes to figure out how to compose a decent image, I noticed that the side of the engine was really shiny. I took a few reflected frames, but they weren't too interesting. Soon thereafter, the firefighter (who had been inside) came outside and asked tenants how to get in touch with the building manager. After chatting with them for a bit, he went to fetch something from the cab of the fire engine. I fired off a couple frames as he stepped back onto the curb and got this one, which I really like. It's clear that folks are waiting uncomfortably outside (especially in the large version), as well as why they're outside.